The Hotkeys section of the Settings window displays all hot keys and key combinations that are used in the UnigineEditor2 and provides you with an opportunity to assign custom hot keys and key combinations for the required action. To configure hotkeys open the Settings window by choosing Window -> Settings in the main menu and select Hotkeys section. Each action is represented by a key or a key combination. Ctrl, Alt, Shift and mouse buttons are used as modifiers for the key bindings. Some of the actions can be represented by the modifiers only. The mouse buttons can be used as the modifiers only for some of the actions. A built-in preset is used as the basis of a custom preset. UNIGINE 2 The main preset. 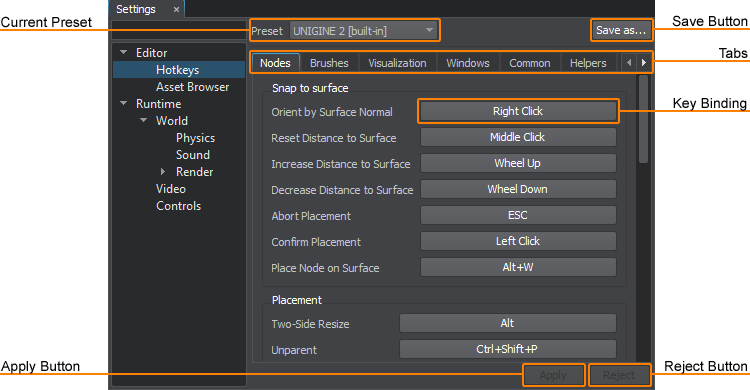 Hotkeys and key combinations that are used in this preset are usual for many 3D editors, for example, 3D-Coat, Maya, Marmoset, Unreal Engine, Unity and so on. 3ds Max This preset contains hot keys that are used in the 3ds Max. You cannot change a built-in preset. Only custom presets can be modified. If you change the default hotkey or key combination and click Apply, you will be offered to save your modifications to a custom preset. Such approach allows you to go back to using the built-in preset at any time. Custom presets are necessary when you want to change some hot keys (or key combinations) and save these changes. In the Controls window, choose the built-in preset, on which the new preset will be based. In the Save Preset As file dialog window that opens specify the name of the *.preset file and location where to save it. Click Ok. The new preset will be set as the current one.